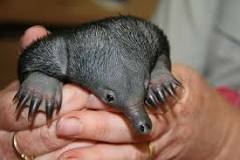 A puggle is the baby of an echidna, an Australian cousin to the platypus. It is sometimes called a spiny anteater. Puggles are incubated for about 11 days in the egg they start out in, then hatch and finish growing in Mama's pouch. 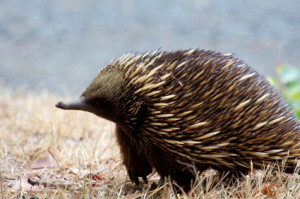 The top photo is of a puggle, and the one to the right is of an adult echidna. Cute, eh?